The NAS video was a fun departure for woodworking for a bit. I got my nephew to turn a pen. He really enjoyed it! I might have enough footage to make a video. My mom didn’t want to be on camera and we ran out of time so she didn’t turn anything. I started designing the living room tables. I’m leaning towards adding some curves into the design. It will lean towards mission style. I got a slab of hickory from Shawn Stone to use for the legs. The air cleaner cart is still working great! Jay, just wanted to let you know I really enjoy your Video’s. I’m disabled and I love wood. And to see what I can make out of what would I can find. 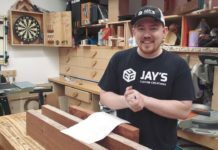 I have been into wood working most of my life. I have been a carpenter, Plumber, Propane Tech, Glass Glazier, just a jack of old trade’s. But I have always come back to wookworking. I’ve got one grandson, and I try to make him as many trucks and cars, even have tried making some crane vehicle’s. But I do enjoy watching your Video’s. Mike E, keep working with your grandson – he will keep you young! 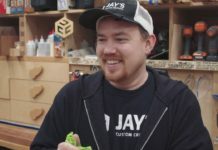 Jay, I also enjoy your videos. Lighting, production, editing are all first rate.